You can adapt memoQ keyboard shortcuts to your personal preferences or to be ergonomically compatible with other translation environments tools you use frequently for better productivity and reduced risk of errors. Although keyboard shortcuts can be managed in the Resource Console, it is more useful to do so under Tools > Options… > Keyboard shortcuts, because that is the only place where a given set of keyboard shortcuts can be selected for use. Marking the checkbox for a list in the dialog shown above will make it the active one. Look carefully at the keyboard shortcuts available in memoQ. Not all of these commands are found in menus (for example, the shortcut for quick search with selected text in a translation grid, Ctrl+Shift+F by default). To examine a set of keyboard shortcuts, select it and click Edit to show the list. 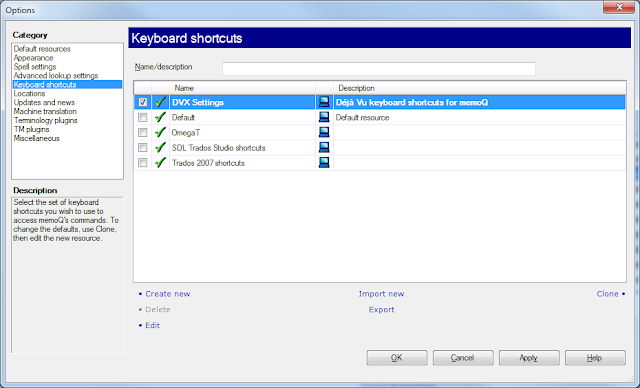 To change a keyboard shortcut, select the value in the Shortcut key column of the editing dialog and press the new key combination. Just by the way: It would be nice for the migrants to find and download these mqres files for former OmegaT users etc. somewhere, esp. in the download section on the Kilgray website. And the customization is fine, but unfortunately (as far as I know from the Yahoo list) it won't be extended. I would really like to use more shortcuts (e.g. for deleting comments ...). Great minds think alike. I was telling someone at Kilgray just recently that I thought some preconfigured sets for a few other major tools ought to ship with the software or be put on Language Terminal... but I think the best/fastest way for that to happen is for those who have made the trip to pass on their configurations. I did that long ago w/ DVX - here on the blog I think - but I never bothered to upgrade to the newer version of DV, so someone else will have to take that baton and run with it. I think the Studio shortcuts would be more important than DV in general. But I wouldn't object to upgrading the OmegaT set based on feedback from power users of that tool.